As an author and someone who has spent the last several years exploring best practices in thinking and learning, I have the opportunity to collaborate with teachers and schools around the country. Whether it’s working on one-to-one initiatives or inquiry circles, in classrooms with just one device or those employing the workshop model, I’m often asked my thoughts on digital reading. I’ve heard many conversations recently that push back on digital reading and identify factors for why it’s a less effective mode for comprehension. Starting with citation of the Nielson Norman F Study (2006) that tracked eye patterns for reading web content emphasizing a skim and scan technique over deep reading to Anne Mangen’s work on comprehension and cognition in print versus digital text, we can find reasons for why we should NOT use digital tools to teach kids how to read. Yes. We should use print texts with students. The effects of reading books and articles are research-based, teacher-tested and kid-approved. Books have been written, papers published and speeches given on how, why and which strategies kids need to comprehend. We’ve taught minilessons and conferred, assessed and reflected, and thus, invested huge chunks of time determining the skills our kids need to be effective readers of paper text. Despite spending the past 40 years deeply investigating reading comprehension, we continue to evolve our ideas and instruction as we teach students to be even better print readers. Have we explicitly taught our students HOW to be effective digital readers with the same energy that we’ve taught them to be print readers? More so, are we expanding their definition of what it means to “read” and providing them layered opportunities and differentiated entry points to read, view and think deeply? Just as we wouldn’t give our students an end of unit test before we taught the content or expect third graders to know their multiplication tables without instruction, we can’t give up on digital reading before we’ve explicitly taught our kids how to do it. How many minilessons have you taught this year that guide students to become effective digital readers? Do you have anchor charts or scaffolds in place that will support them as they attempt to read digitally with independence? Have you provided ample time for them to read diverse genres or self-select their onscreen reading material? I’ve spent the past year writing about this with Katie Muhtaris and we believe a balance of print and device, chunks of time for online choice and informational text, paired with explicit instruction in digital reading is the most effective course of action. On a screen, students must navigate new text features, hyperlinks and digital distractions as they read. Annotation looks different as sticky notes are often typed and not handwritten, color-coded, and stored within the device. We need to “notice and note” these differences and give kids strategies to use these tools effectively. But, digital text also yields new opportunities for readers to access additional content. Embedded audio, video and high-quality visuals can amplify active literacy as students are invited to read, listen, view, research, interact and respond to the text. These multimodal supports can often enhance the reading experience as students build and use a multifaceted approach to thinking. With e-readers breaking onto the market only 10 years ago and the iPad recently celebrating it’s 5th anniversary, it’s important to stop and ask ourselves: have we had enough time to teach the skills our students need to be successful digital readers? Because there’s so much more we can do! We’ve long known that curiosity and the ability to comprehend far outpace a child’s reading level. By differentiating the resources our students have access to, we can build skills and strategies that help learners become better readers. For a long time, I’ve been an advocate for re-imagining what it means to read. As a primary grade teacher, I invite students to read images, artifacts and even toys. In Connecting Comprehension and Technology, we detail lessons on viewing to learn with short video clips and explicitly teach kids to annotate movies just as they do with text to build comprehension. In Falling in Love with Close Reading Chris Lehman and Kate Roberts charge us to expand our definition of reading closely and to extend it across the grades to include not only text, but also media and life as tools to make sense of the world. Working as an Apple Distinguished Educator my thinking has been fueled by innovators like Don Goble who has pushed me to consider media literacy as the most important skill we’re NOT teaching. Take a moment and think about the websites you view as an adult. ESPN. BBC. CNN. Video, image, image are what appear at the top of each page on today’s search. In fact, looking at the sites closely one can see that images and video capture more real estate on each homepage than text. To be effective consumers and more importantly, effective communicators, we must explicitly teach kids to analyze, evaluate and create messages in a variety of media–print and digital (See CCSS Anchor Standards or ISTE Student Standards for more information). To do this, we have to give learners time to read images, video and multimedia presentations. We must guide them to analyze photographs, infer the artist’s message and identify bias. We must teach kids to read and reread video by showing them how to pause and watch a video clip multiple times to ask questions, clarify and look and listen once again through a different lens. In fact, we probably need to move beyond the terms “print” and “digital” and simply teach kids to be effective thinkers in every context. I firmly believe today is the best time to be an educator! We now have more access to information than ever before. We can use a child’s curiosity to connect them to countless titles and authors and introduce them to new genres and modes for thinking. Terrific sites like Wonderopolis and Newsela provide daily opportunities to pair text, images and media to grow readers. We can use books to spur inquiry as kids read text and then connect with an author on Twitter or use kid-safe search engines to conduct further research. For me, it’s not an either / or debate, but instead, kaleidoscopic in nature. Great titles inspire online research. Curiosity fueled by a video clip guide students to read informational text. Devices provide emotional security as kids read text at their level while not being judged by the “thickness” of their book. Mindcraft inspires technical reading. Image study builds background knowledge. Choice motivates all learners to do more and show what they know in modes that are meaningful to them. Digital reading does not replace print; instead it adds to and enriches our understanding of all types of text. In their new book, Digital Reading: What’s Essential in Grades 3-8, Bill Bass and Franki Sibberson write, “The addition of technology is not about giving up what we’ve always believed about literacy, but it’s about expanding upon what’s possible and what we’ve been doing in our reading and writing workshops.” (2015). And yes, to building readers. This is not a zero sum game. Kristin Ziemke has spent her career teaching and learning from children in urban and suburban school districts. A teacher and innovation specialist in Chicago, Kristin engages students in authentic learning experiences where reading, thinking, collaboration and inquiry are at the heart of the curriculum. Co-author of Connecting Comprehension and Technology (Heinemann, 2013), Kristin pairs best practice instruction with digital tools to transform learning in the classroom and beyond. An Apple Distinguished Educator, National Board Certified Teacher and Chicago’s 2013 Tech Innovator of the Year, Kristin seeks opportunities to transform education through technology innovation. She collaborates with educators around the globe as a staff developer, speaker and writer. To learn more follow Kristin on Twitter @KristinZiemke or visit her website at KristinZiemke.com. Look for her upcoming book Technology Foundations: Power Up with Digital Teaching and Learning this fall. I agree that we can find a balance here, and I am glad that you included Julie Coiro and some of her (and her colleagues from the New Literacies initiative) here. Reading a digital text can be different than a non-digital text, and yet, we never really seem to address that in our classrooms. It’s a fascinating development in the way we consume information — maybe neither good nor bad, just — it just … is. Now, let’s help our kids navigate it. I think noticing it for what it is, being reflective on what we see our kids do, and providing explicit support based on those noticings is the initial step in our data collection on how kids read and comprehend with new devices. Once we’ve taught them some of the baseline strategies for reading digitally we can then build a body of understanding for the skills they need to be effective thinkers in every context. Look for a variety of digital reading lessons in our new book Technology Foundations (Heinemann). Thanks for your energy for this work and your commitment to building readers. Onward! What an excellent article. I agree now with a balanced approach. When we read we interact with both text and author. I’m hopefully doing it now. Library skills (e.g.. searching, cross referencing etc.) are paramount whether real books or digital. I have such a strong need though to hold a paper book in my hand to read … the feel, the smell, childhood memories. Thanks for posting. I think guiding kids to search effectively is one of the most important things that we can teach them! Society is now shifting away from memorizing events and dates to instead knowing how to access the information you desire quickly. I’m not saying that today’s learner need not recall some important information, (remember–I’m an advocate for balance) but now we can use a child’s curiosity and the wealth of information we have access to online to guide them to become even more knowledgeable readers. -A paper book is better because it will never run out of battery. -Paper books have that good smell and make the “crack” sound when you open it. -If you fall asleep with an iPad, it would be all sharp and pokey on your cheek. Their preferences vary from year to year, but consistently my language learners and students with needs prefer digital reading as the assistive features often provide them the additional support they need to be independent. I don’t have long term data on this, but it’s definitely something to think about. Thanks for the comments and keep up the good work! Loved this post. Agree with a lot of what you say here. Lots of great references to follow up. Hard to believe that the iPad is only 5 years old; it feels like it has been with us forever! LOL! I know, right? Thanks for the feedback Elisa. I appreciate it! Have we explicitly taught our students HOW to be effective digital readers with the same energy that we’ve taught them to be print readers? Great question to ask ourselves as educators, parents and homeschool teachers! Reading with a digital devise is a yes and for me! i’m pretty agree, almost of all students in the modern school that provided internet connection facility focused on ‘google’ to answer or to do some assignments, they always think that internet’s able to answer everything they should know, that’s why this generation had less printed reference or book than the generation before. #i’m still beginner, i’m sorry if my English’s not good, thanks. Excellent job posting in English LinaFitriara! Google is one of many search tools, but not always the best tool for elementary learners. Our role as educators is to teach students age-appropriate search tools that they can use in school, but more importantly use safely when we’re not around to supervise them. Part of the emphasis on media literacy is to teach kids to analyze an author’s message, identify the source of the information and add their thinking to what they find online. If we can teach them how to think they’ll be able to seek and use information effectively. Thank you for this great article emphasizing the importance of both mediums. We are about to go 1:1 for grades 3-8, and as the school librarian, I strive to find the optimal balance between print and digital, while adhering to your point that “Choice motivates all learners to do more and show what they know in modes that are meaningful to them.” Connecting Comprehension And Technology is in my TBR pile–looking forward to reading it this summer and implementing some of the suggested strategies! Thanks for the kind feedback Anne! I’d love to hear your thoughts once you finish Connecting Comprehension and Technology. We need to harness our best librarian, media specialists, technology educators and teacher minds behind this so we can create experiences for learners to be successful in any media. I look forward to ongoing collaboration with you and have enjoyed your tweets. Good luck with your 1:1! As a former teacher, and an author of seven children’s picture books which strive to teach values disguised as fun stories, I really enjoyed this article. I am a firm believer in the value of the printed book, especially since most children don’t got to bed with a Kindle in their hands, but I have had all of my books converted to eBooks as well. It seemed especially appropriate for sharing books internationally. Since one of the previous comments mentioned that the iPad is only 5 years old, it’s interesting to note that today’s kindergarten kids have had access to digital media since infancy. I wonder what impact this will have on digital learning patterns!! Thanks for the thoughts Sherrill! It is interesting and exciting to think about the future of digital learning. As you noted, both mediums hold a lot of value. Like you, I love printed books. I take pride in having a personal library in addition to my classroom library (yes, Nerdy fans, I do read “grown-up” books…sometimes.) And that’s exactly why we as informed readers and educated practitioners need to investigate both mediums, define best practice and craft opportunities for balance so that our kids can grow as readers in both areas. Good luck writing more picture books! On behalf of the Nerdy community–thank you!! This area of educational research is so new it is hard to find quality studies that can guide educators. It’s hard to believe the iPad and Kindle are only 5-8 years old and they have completely altered the educational landscape. We are in the infancy of the digital revolution in our schools. Whether we like it or not we are heading towards multimedia reading/learning. 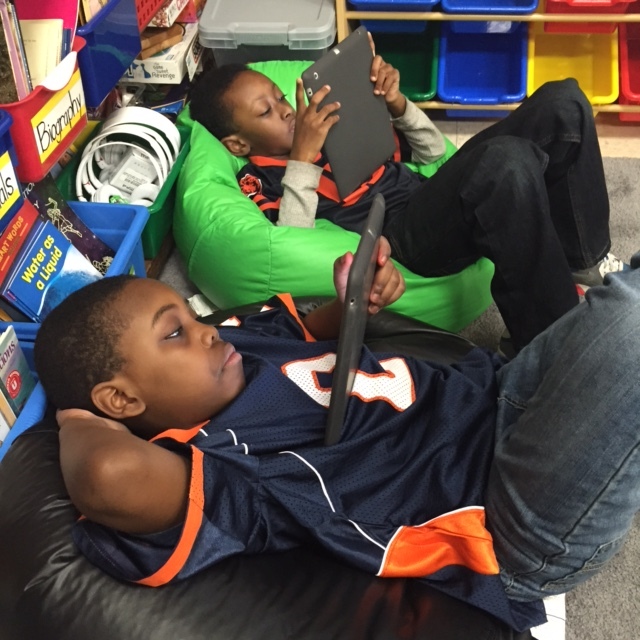 I appreciate how this article highlights ‘best practices’ for teaching digital reading. School districts need to be proactive in preparing teachers for this rapid shift. One area where I am curious to see more research on this topic is surrounding struggling readers. Depending on the findings I think in the next 5 years this will either be one of the biggest debates in education or a complete nonissue. Thrilled to hear you’re thinking so deeply about this Patrick! As I shared in the earlier comment, while research is still in the infant stages for reading on mobile devices, I’ve seen a significant impact with my readers who are language learners or reading below grade level. While we know all students need to read and decode text, we find new opportunities to build comprehension and use that as the carrot-on-a-stick to guide them to become better readers. We’ve long known comprehension outpaces reading ability (ask any kindergarten teacher!) and now have more materials to build those comprehension strategies and thus, nudge our kids into the world of reading! It’s the best time to be a teacher and I’m honored to have thoughtful colleagues like you to share in this adventure. Onward! Excellent article. Can I ad another point about how digital literature makes reading possible for those with print disabilities? 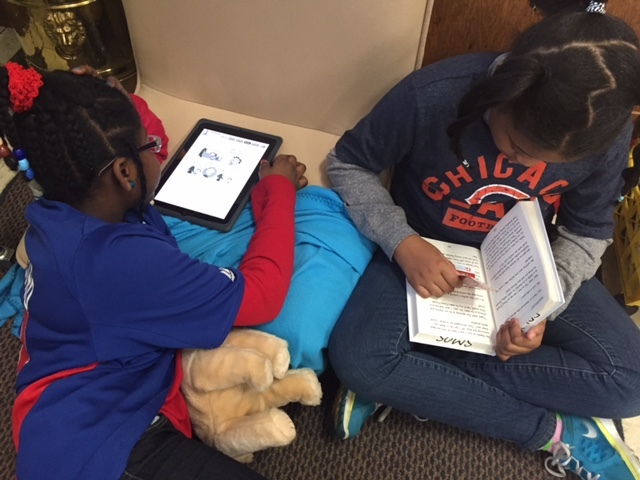 Students who are blind or low vision, students who can’t hold a book or turn a page due to physical challenges or those who struggle with decoding or fluently reading grade level text now have the ability to read what their friends are reading. They can participate in the discussions, many for the first time. Digital text opens new possibilities and this reality should never be overlooked. Wonderful point Karen! Thank you for sharing! The accessibility features on many digital platforms invite so many more learners to the reading adventure. Voice over, print enlargement, and switch control are a few of the amazing features that allow students to enter the educational experience with independence. The sense of agency and empowerment these tools provide is beyond measure. An #eduwin for all! What a great post. I am constantly trying to work with educators and parents to remind them that we are accessing most information digitally. What I have not seen yet is someone talk about teaching students how to read digitally. There are definitely new strategies that will help students optimize the experience. Where students have choice we should allow them to choose between reading a digital text or paper based. I think having access to a good library of both is essential. We do have to remember though that most of making the decisions on providing digital or text content is often done by those that learned to read with only the paper medium and sometimes this bias does not consider digital text strategies as something that needs to be taught. +1 to rich libraries that offer high-quality texts in print and digitally MGuerena! I was just with Donalyn Miller a few weeks ago and got to listen to her talk about teacher bias when matching books to readers. She charged attendees to push beyond their preferences and bias in reading so that we can find the books our students need. Though we might not be fans of all genres (or, if you’re like me, lacking in your expertise of fantasy) we need to read widely so that we’re able to recommend the right book at the right time for our students as part of the larger mission to build readers. I think we can raise awareness of bias with digital tools too. We need to carefully distinguish between best practice and teacher preference and explore the wide variety of new options available to our students. In doing so, we can determine the effectiveness of the tools that are out there, provide feedback on what we’d like to see on the market as devices and applications evolve and collaboratively craft new lessons that will meet our goal of building life-long readers and thinkers. Wonderful and important post and brilliantly written. I’m thrilled to have such knowledgeable people in the field of education guiding our youngsters. I agree…children must be taught to read everything! There is no choice. This is the digital age and we must help children navigate how best to get the information they want or need. I’ve been retired six years now, but when I taught 4th grade I used the laptop carts frequently. I wish I had read an article like this then, so I could have addressed some of the issues like links, notes, etc. that come up with digitial material. It sounds like you were doing amazing things with students. Thank you for continuing to think about these important issues in education. I hope that you’re still mentoring teachers–we all need continued support and feedback from seasoned veterans. Best to you! Whoa, I didn’t know how badly I needed this today until I read it. Your line about now being the best time to be a teacher… chills. The climate around teaching and being a teacher can feel dark and sullied lately, but our kids live in the best time to access information and to send it out into the world themselves. Being a teacher right now means having opportunities teachers in the past never did. Thank you for the reinvigorated spirit to love this profession and for the deep thinking I need to continue to do to teach digital reading explicitly. Thanks for your thoughtful feedback Ben! So much of what I believe about reading comes as the result of working alongside teachers like you. “Growing up” as an educator immersed in conversations about children’s literature and professional book study taught me WHY reading matters. Our ongoing conversations about instructional practice have led me to explore all new opportunities through a lens of pedagogy. I hope we can continue to learn together and share widely with teachers everywhere as we know the role professional collaboration can play. Today is the best time to be a teacher and the most important time to advocate for our kids! While it often may feel as though others are not listening, our students learn from what we say and do each day. We teach them to evaluate information, be informed consumers and ultimately, think critically. Enjoy these last few weeks with you students!